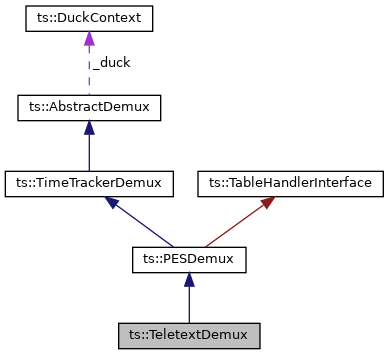 The TSDuck execution context is accessible to all subclasses. Number of TS packets in the demultiplexed stream. Current set of filtered PID's. This class extracts Teletext subtitles from TS packets. [in,out] duck TSDuck execution context. The reference is kept inside the demux. [in] handler User handler for Teletext notification. [in] pids The set of PID's to demux. Activate or deactivate the font color tags in the output text. [in] addColors If true, font colors tags will be inserted in the output text. Check if font colors tags are inserted in the output text. True when font colors tags are inserted in the output text. Flush any pending Teletext message. Useful only after receiving the last packet in the stream. Implicitly called by destructor. [in] handler The Teletext handler. Get the number of Teletext frames found in a given page. [in] page Teletext page number. [in] pid Teletext PID. If omitted, use the first PID containing frames from the specified page. Number of Teletext frames found so far on page. Reset the demuxing context for one single PID immediately. [in] pid The PID to reset. This hook is invoked when a complete PES packet is available. Can be overloaded by subclasses to add intermediate processing. [in] packet The PES packet. 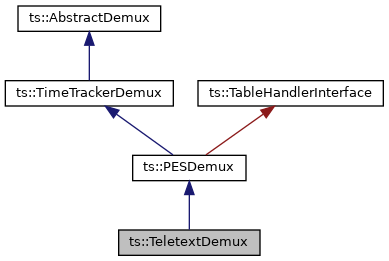 The following method feeds the demux with a TS packet. [in] pkt A TS packet. Replace the PES packet handler. [in] h The object to invoke when PES packets are analyzed. Get the current audio attributes on the specified PID. [in] pid The PID to check. [out] attr The returned attributes. Invoke its isValid() method to verify its validity. Get the current MPEG-2 video attributes on the specified PID. Get the current AVC video attributes on the specified PID. Get the current AC-3 audio attributes on the specified PID. Check if all PES packets on the specified PID contain AC-3 audio. True if all PES packets on the specified PID contain AC-3 audio. Due to the way AC-3 is detected, it is possible that some PES packets are erroneously detected as AC-3. Thus, getAC3Attributes() returns a valid value since some AC-3 was detected. But, on homogeneous streams, it is safe to assume that the PID really contains AC-3 only if all PES packets contain AC-3. Get the number of milliseconds measured on a PID. The number of milliseconds of the content of the specified pid, since the beginning of the stream, based on the PTS of this PID. If no PTS were found on this PID, use PCR's from another PID. Return zero is no timing information was found. Replace the list of PID's to filter. The method resetPID() is invoked on each removed PID. [in] pid_filter The list of PID's to filter. Add one PID to filter. [in] pid The new PID to filter. Add several PID's to filter. [in] pids The list of new PID's to filter. Remove one PID to filter. The method resetPID() is invoked on pid. [in] pid The PID to no longer filter. Get the current number of PID's being filtered. The current number of PID's being filtered. Check if a PID is filtered. [in] pid The PID to test. Tue if pid is filtered. Useful when the transport stream changes. The PID filter and the handlers are not modified. If invoked in an application-handler, the operation is delayed until the handler terminates. For subclass implementers, see beforeCallingHandler() and override immediateReset() instead of reset(). Reset the demuxing context for one single PID. Forget all previous partially demuxed data on this PID. If invoked in an application-handler, the operation is delayed until the handler terminates. For subclass implementers, see beforeCallingHandler() and override immediateResetPID() instead of resetPID(). Set some arbitrary "demux id" value. This value is chosen and set by the application. It can be retrieved later if a table or section handler is used by several demux. The demux id is not interpreted by the demux, it is only stored for the application. The initial value of a demux id is zero. [in] id Application-defined demux id to assign. Get the "demux id" value, as previously stored by the application. Helper for subclass, before invoking an application-defined handler. The idea is to protect the integrity of the demux during the execution of an application-defined handler. The handler is invoked in the middle of an operation but the handler may call reset() or resetPID(). Executing the reset in the middle of an operation may be problematic. By using beforeCallingHandler() and afterCallingHandler(), all reset operations in between are delayed after the execution of the handler. [in] pid The PID for which the handler will be called. All reset operations on this PID will be delayed until afterCallingHandler(). Helper for subclass, after invoking an application-defined handler. [in] executeDelayedOperations When true (the default), execute all pending reset operations. True if a delayed reset was executed.